Hello! Vintage sizes are weird, y'all. I thrifted a little pair of red bell bottom pants marked a size '7' a few months ago and when I tried to slide them on, I couldn't even get them up to my knees. Now let me be clear here, size does not matter to me at all. I haven't weighed myself in years and if you ask me my size, chances are I'd just look back at you puzzled. Sizes? What are sizes? Numbers on tags that supposedly indicate if a garment is going to fit you? Screw numbers, am I right? Screw sizes; different brands run differently, sizes change frequently and quite frankly, what in the world gave a number the power to determine how someone feels about themself? I'm not going to worry about a silly little number which is largely the reason I have no idea what size I wear. That and the fact that I don't wear bottoms and thus, essentially have zero need to rely on number sizing. Those size '7' bellbottoms? They fit the tiniest model who has ever modeled for RaddayVintage who typically wears the smallest size out there. 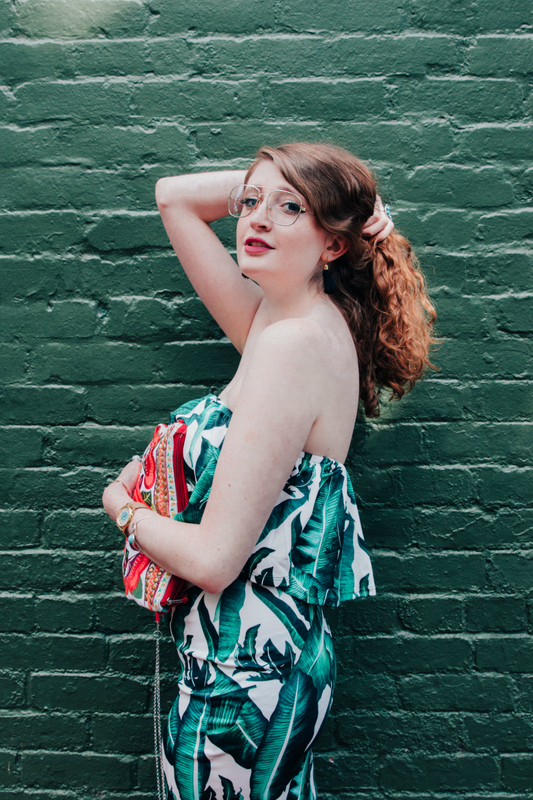 Clothing sizes are a mess in general but once you delve into vintage, you sort of lose sight of any sizing that makes sense. Sizes have changed so much through time and you really can't rely on that number on the tag to help you figure out who it'll fit; I do most of my styling through estimates. I guess you could say I've gotten pretty good at just judging what will fit who just from looking at both the item and the person. But this little pink daisy dress threw me for a loop. 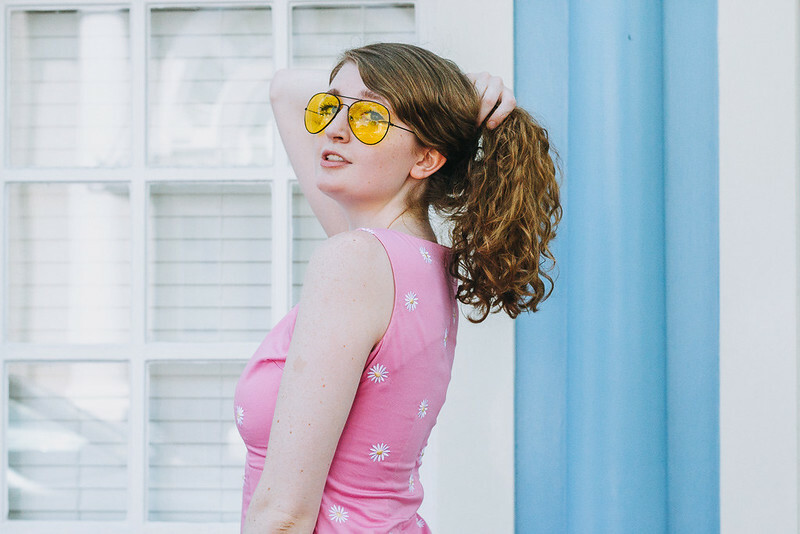 When I spotted it at a local thrift store on a buying trip for RaddayVintage, I immediately fell in love with its feminine pink color, rad nineties daisy print and chic spring silhouette. I had initially hoped the dress would fit me but when I saw the "4 petite" label, I figured that chances of the dress fitting me would be slim. I'm 5'9" with legs for days and a larger chest that often forces me into size "large" dresses. The chance of me fitting in a petite dress? Laughable at best. But I guess that just goes to show how whack vintage sizing truly can be because I decided to try on the dress and it fit me like a glove. I couldn't wait to wear the dress and donned it for a recent photoshoot with local Virginia photographer, Belinda Farmer. 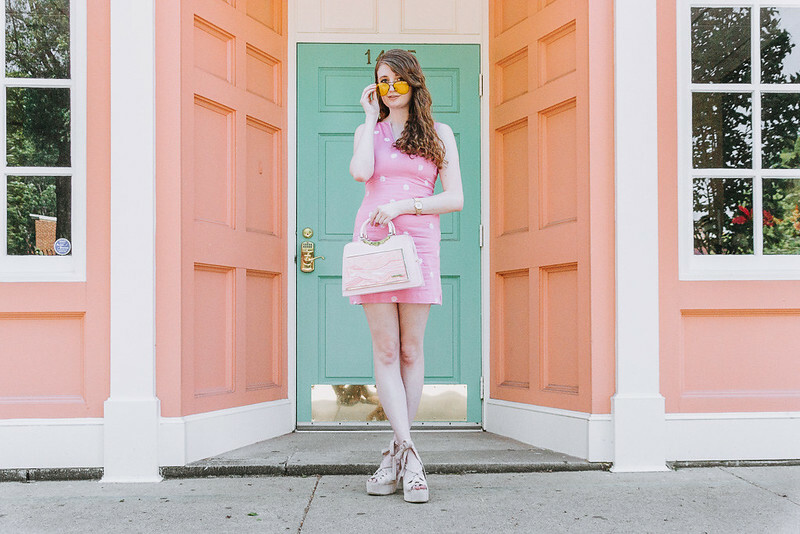 I styled it with several other cheery pink pieces including a statement pink vintage purse and pastel pink lace-up heels. 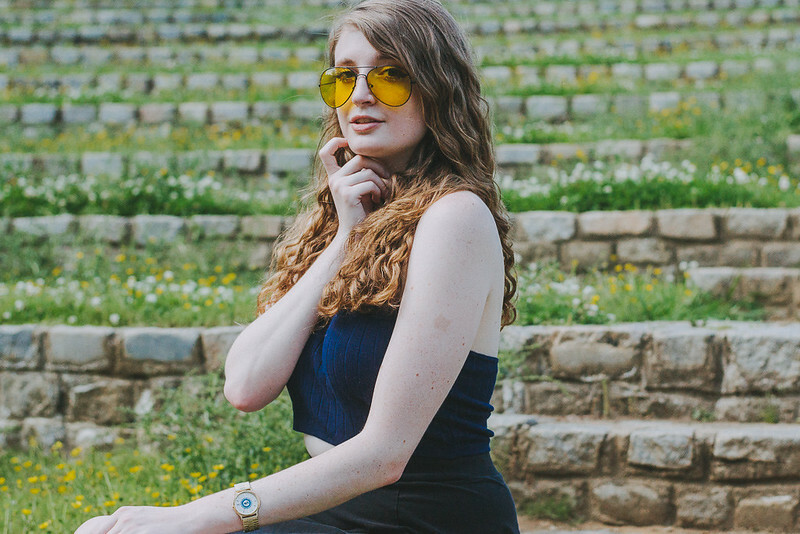 Seventies-inspired yellow aviator sunglasses and a golden watch perfect the look. Photos by Belle Farmer Photo. You can check out more of her work on her Instagram @bellefarmerphoto. Hello! 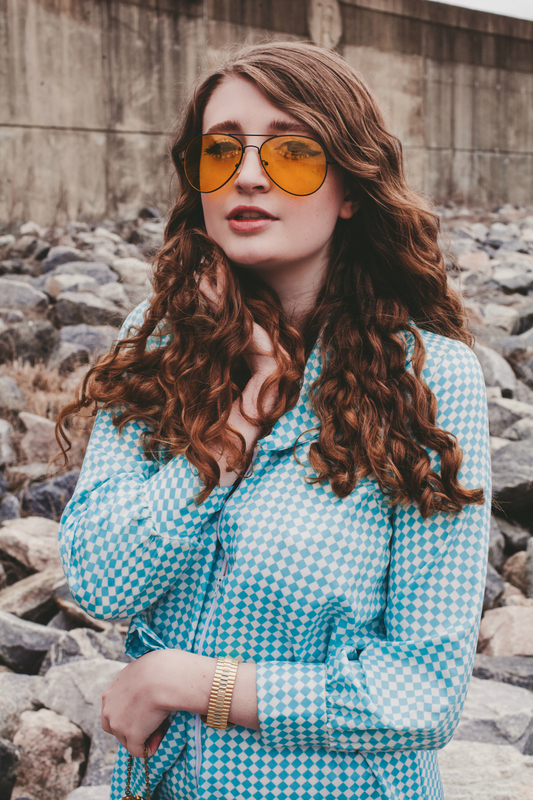 For this look, I felt inspired by retro seventies Americana nostalgia with a hint of Lana Del Rey's influence (note the red heart-shaped sunglasses.) To evoke an all American feel, I pulled out a subtly red, white and blue crop that just screams summer. I styled it with a flattering black mini skirt and chunky denim platform heels. Small details such as my vintage golden watch and vintage navy purse pulled the look together. Photos by Belle Farmer Photo. See more on her Instagram @bellefarmerphoto. Hello! I recently teamed up with Donald J. Pliner as part of their #ArtOfFun campaign. I was delighted to have been chosen to be part of it because I relate so strongly to the notion of the #ArtOfFun in fashion. I strongly believe that fashion should be fun; fashion isn't something to be taken seriously. It's something to experiment with, to play around with. Ultimately, it's supposed to be enjoyable and a way for you to express your creativity through your wardrobe choices. Forget fashion "rules." In fact, throw that rule book right out the window. Wanna wear socks with your sandals? Do it and rock it with confidence. White after Labor Day? Go for it, fashionista! More often than not, looking fashion-forward relies more on your confidence in your look rather than simply just the look. Wear something crazy and own it and you'll be seen as a fashion icon rather than ending up on the worst dressed list. Of course not every look has to be wild, just have fun with it whether that means going all out or simply playing around with mixing prints. And Donald J. Pliner has plenty of footwear options that allow you to do just that. Selecting just one pair of shoes from Donald J. Pliner's incredible selection proved quite tricky. 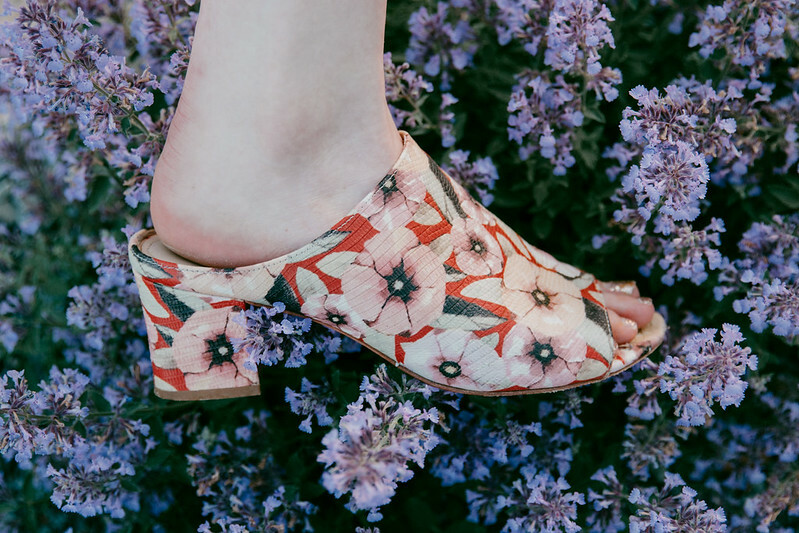 So many various pairs of mules, heels and sandals caught my eye but this cute lil pair of floral mules that I'm wearing above stood out among even the prettiest heels and sandals. I mean c'mon, do you see their pretty pink color, feminine floral design and flattering shape? These are Donald J. Pliner's "Ellis Floral Lizard Calf Leather Mule Sandal" and they retail here for $218. 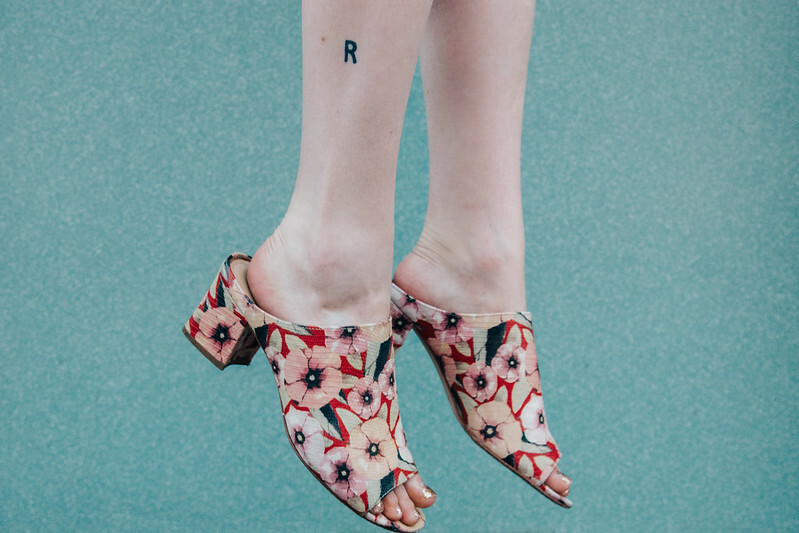 I'm not usually one to rock a shoe with a heel any less than say four inches (and yes, I'm fully aware that I'm ridiculous) but I'm willing to make an exception for these low-heeled mules. They're surprisingly... comfortable? They're easy to throw on when running out of the house in the morning in a rush or for a walk in the park with a friend. I don't have to slip out of them while driving or be careful walking in them while on uneven surfaces so I'd say that's definitely a plus. I still love all of my absurd five inch platform heels but these mules definitely filled a major gap in my wardrobe. I've been wearing them constantly since I received them a few weeks ago; I simply can't get enough of them. I find myself wearing them with practically everything but love them with this white floral dress more than anything. 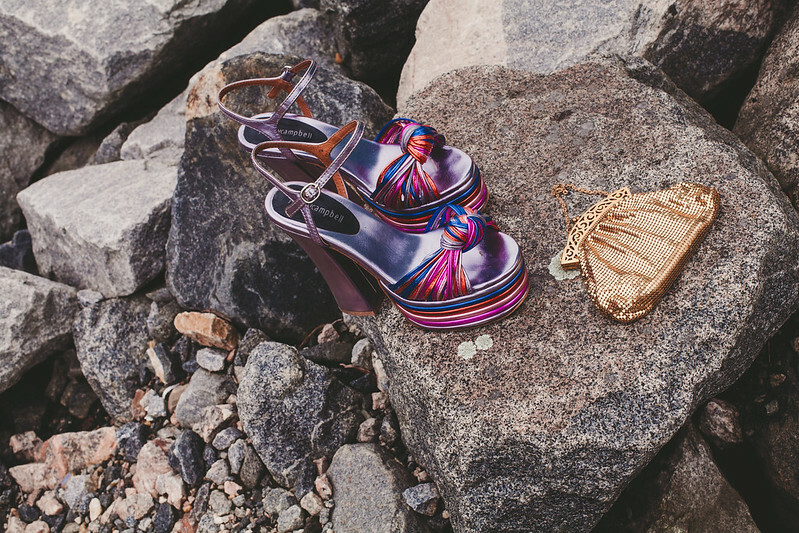 It was almost like this dress was made for these mules. 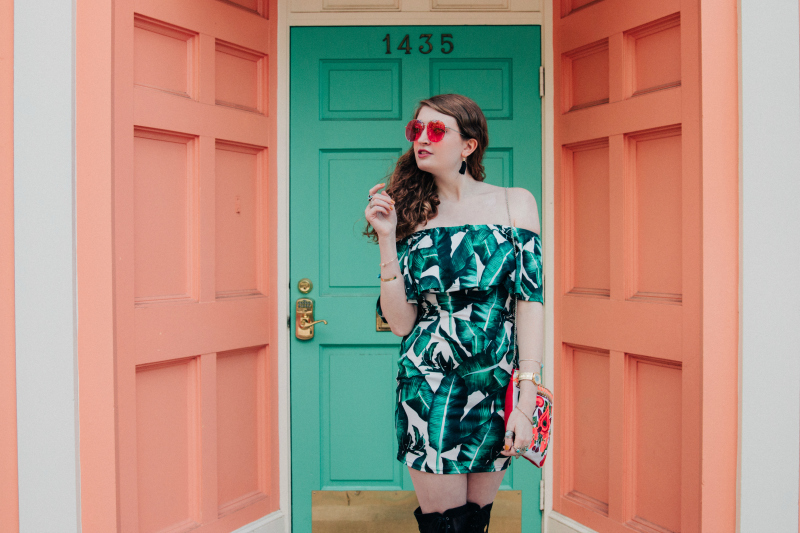 I recently received this dress courtesy of MakeMeChic. You can check it out here for $15. 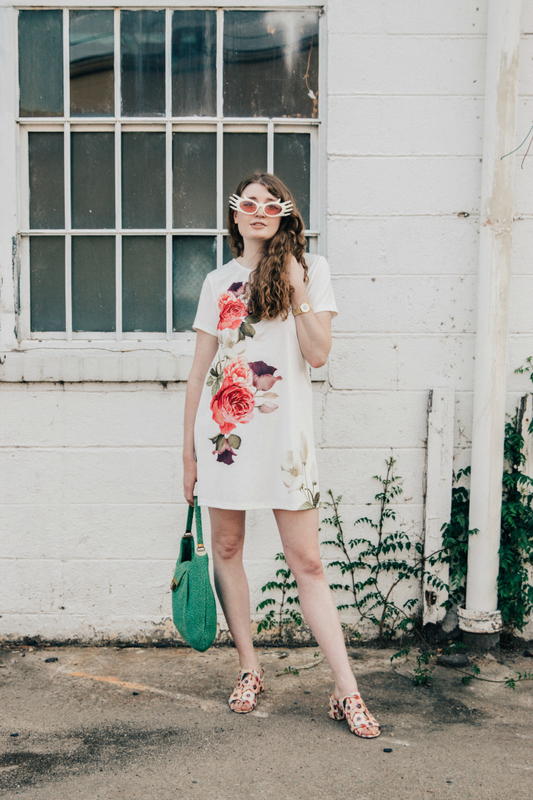 The floral print of the dress perfectly complements the floral print of the sandals while the colors also play against each other flawlessly. Both the mules and the dress radiate feminine charm and a feeling of dreaminess. Of course I had to add a little touch of vintage to the look because is any Tori Radday look complete without it? 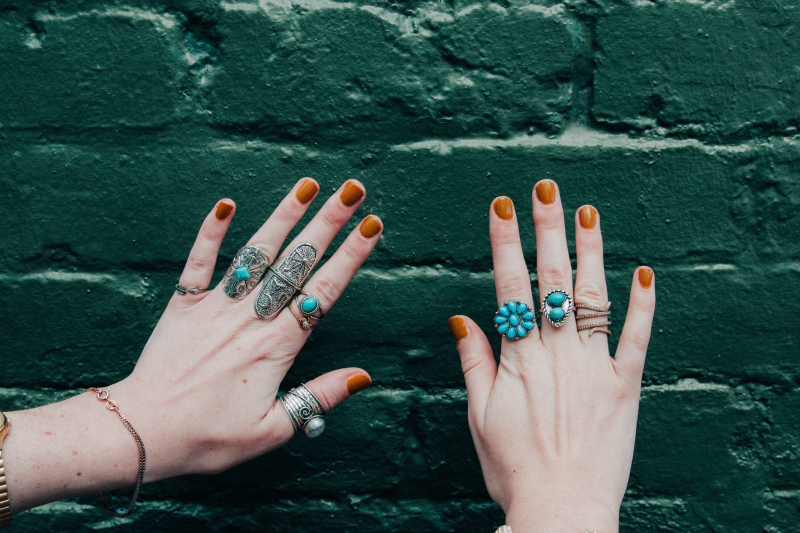 My style is ever evolving but throughout the past couple years, I've found that certain elements define my style and don't come and go with the seasons. 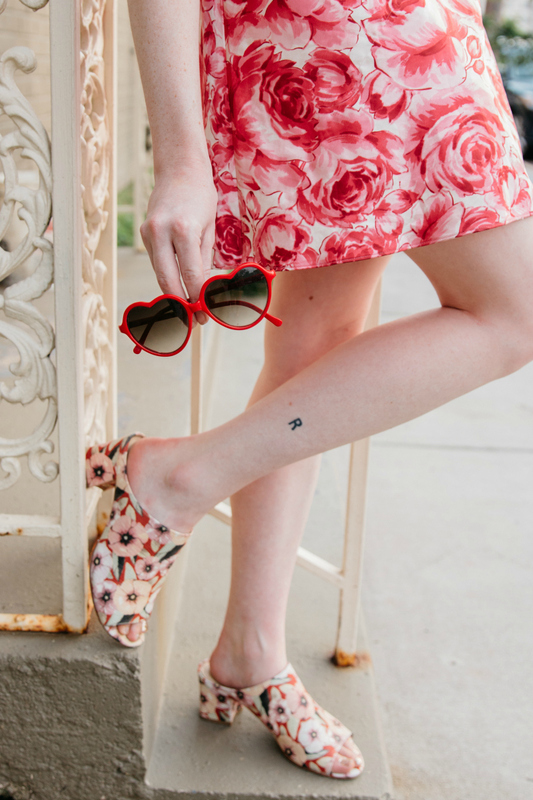 My style is loosely defined by vintage influences, eye-catching heels, quirky sunglasses and pretty little dresses. 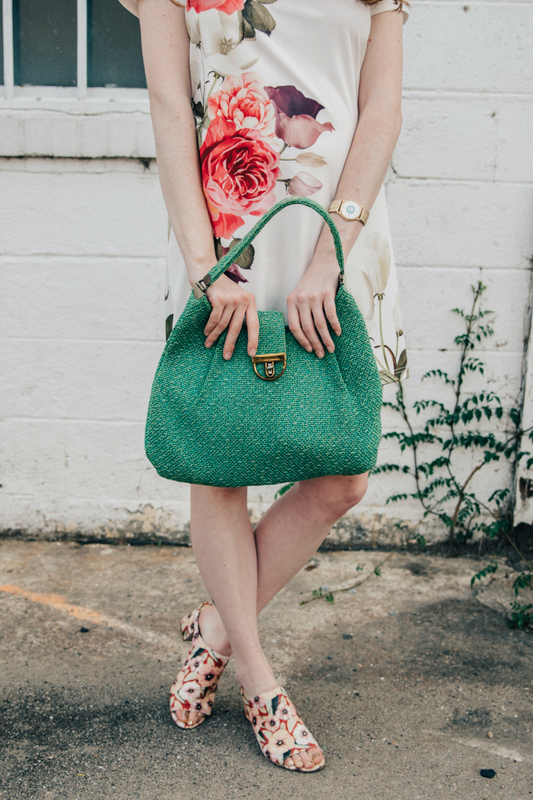 For this look, I grabbed a beautiful green statement purse that used to once belong to my great grandmother. 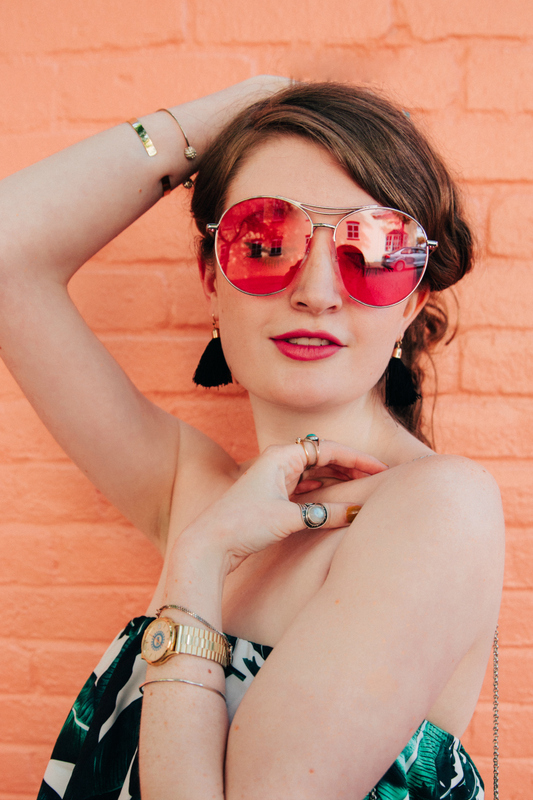 I also slipped on a golden vintage watch and grabbed a couple of whimsical pair of sunglasses for the shoot. Rhinestone adorned lash lines completed the aesthetic. Photos by Rachel Dwyer Photography. 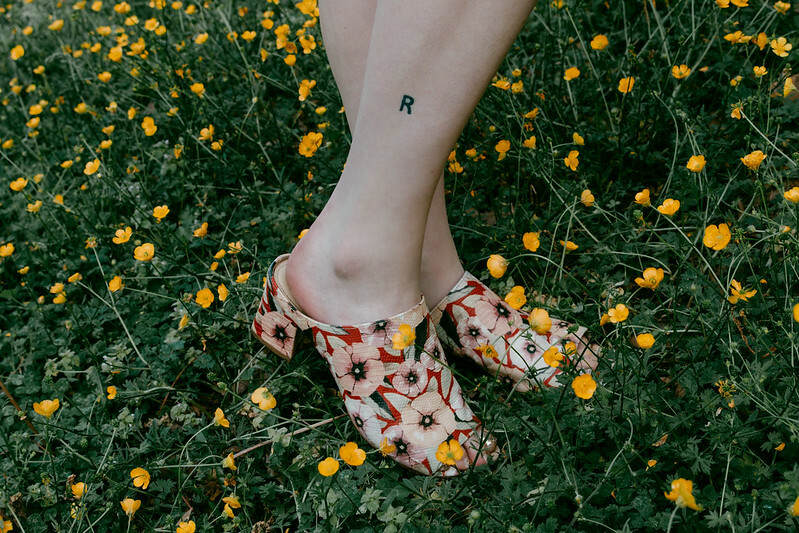 You can check out more of her work on her website or on her Instagram @rrrachel08. Hello! 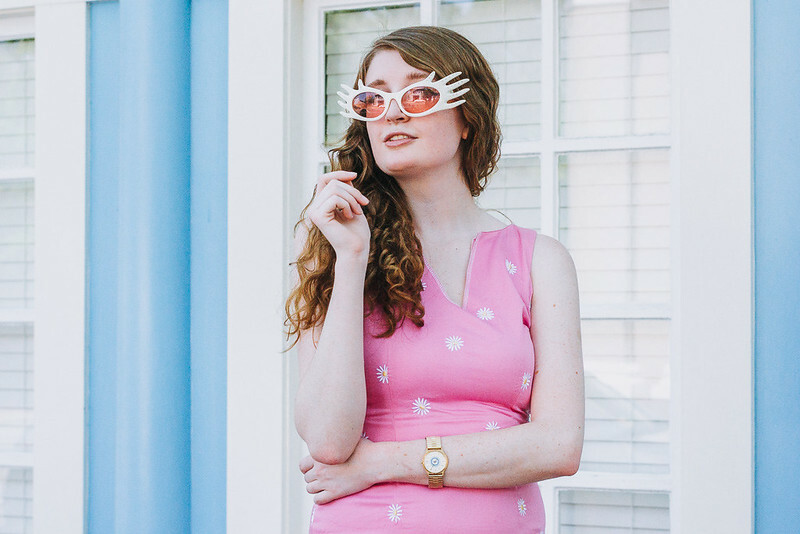 If you regularly keep up with my blog and etsy shop, RaddayVintage, then you might have noticed a decrease in my RaddayVintage presence throughout the past couple of months. I've recently been consumed by various tasks related to moving into my new house which has definitely affected how much time I've been able to commit to my etsy shop. But that certainly does not mean the end is near for RaddayVintage; it's only just the beginning. As my time begins to slowly free up again, I'm looking forward to getting back into the swing of things with my etsy shop. I already have several projects and collaborations lined up for RaddayVintage in the near future. And boy am I excited for them! I'm keeping things pretty hush-hush right now so you'll have to keep an eye on my blog for more updates throughout the next few weeks. In the meantime, I have a few new photos from a recent photoshoot featuring #RaddayVintage that I couldn't wait to share with you all. 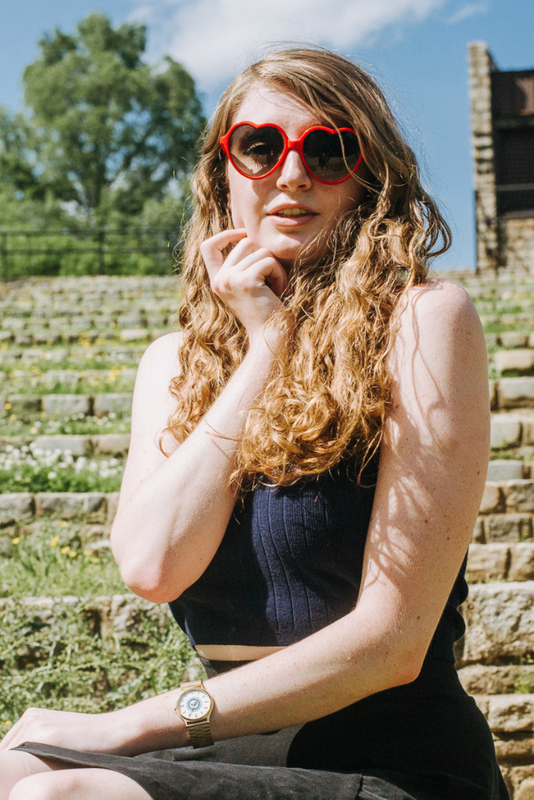 This past week I teamed up with Virginia model and photographer, Peyton Olinger, for a quick shoot in Scott's Addition. 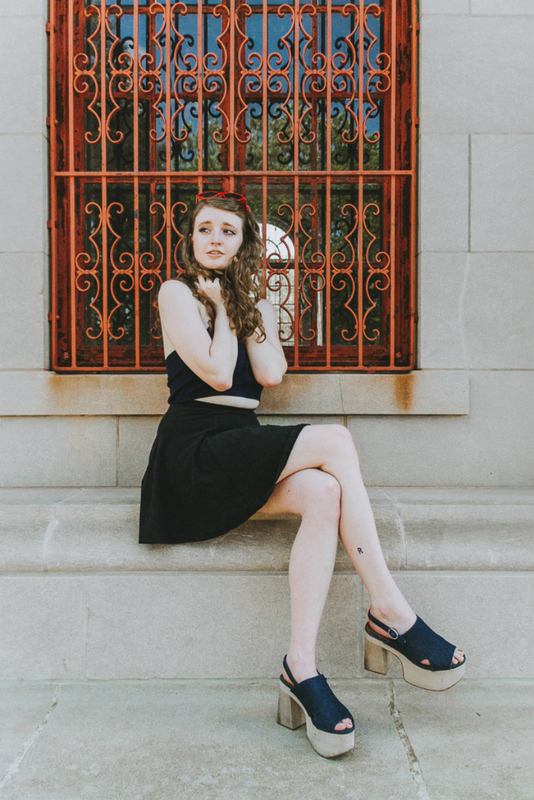 Peyton brought a few pieces from her own personal wardrobe for the shoot and when she pulled out a mod miniskirt, I knew that I wanted to include it in the shoot. I styled it with a cute nineties purple tee available for sale in RaddayVintage, my favorite disco heels, a statement pink purse and chic pink shades. 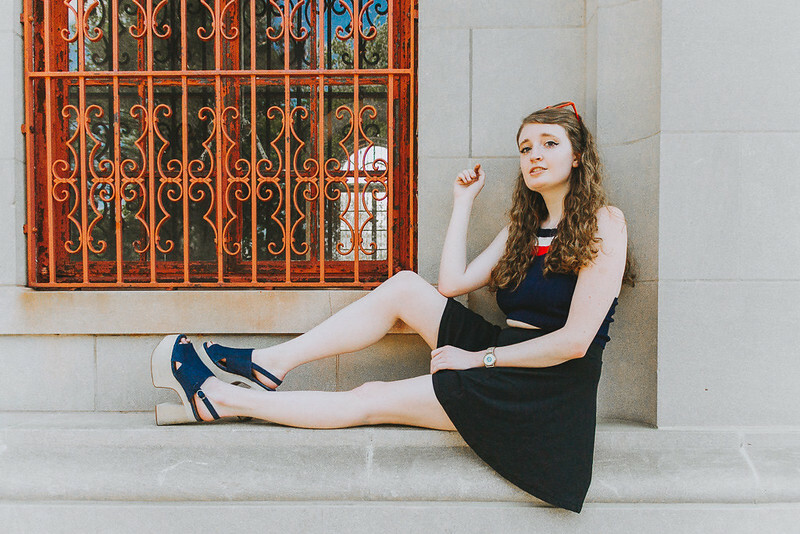 I thoroughly enjoyed working with Peyton as she has an incredible understanding of editorial fashion photography and was eager to try out various poses and concepts. Overall, I'm incredibly happy with how the photos turned out and look forward to working with Peyton again in the near future. 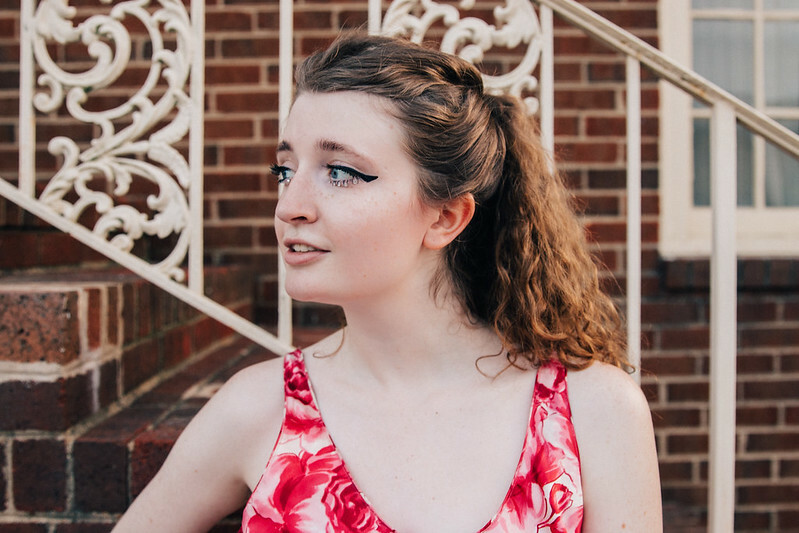 You can see more of my favorite photos from the shoot on my Flickr HERE. You can check Peyton out on Instagram @always4tuesdays. Hello! I recently moved into the house that I purchased a couple months ago which means a LOT of unpacking. While hanging up all of my favorite pieces on my new clothing rack, I noticed something. The color pink. And a lot of it. I organize my clothing by color so it's usually pretty obvious if there's an overwhelming amount of one color clothing. In the past, the color black has always reigned supreme in my wardrobe with about half of my wardrobe consisting of black-colored pieces. Option #1: Femme in pink. Select a pink dress with feminine detailing like the one above. 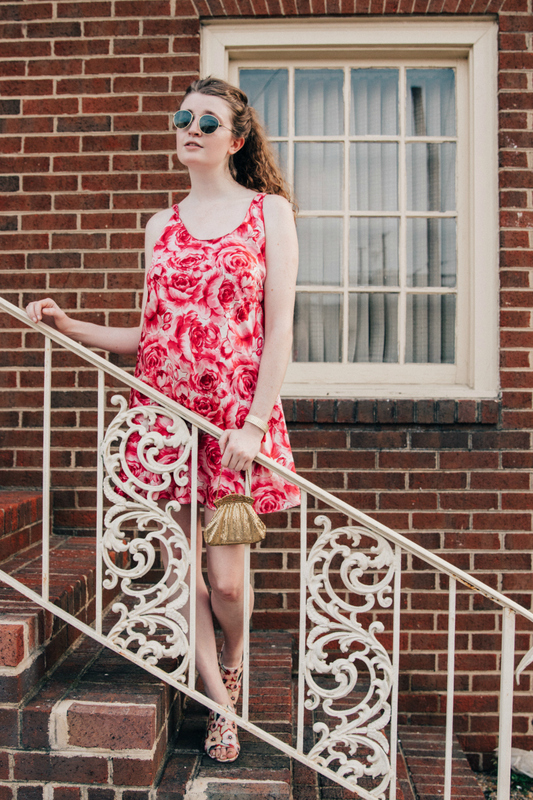 Emphasize the feminine appeal of both the color and style of the dress by pairing it with classically elegant accessories such as an ornate clutch and statement pearl earrings. This look is perfect for Sunday brunch with the fam or your next big interview. Option #2: Nineties queen. 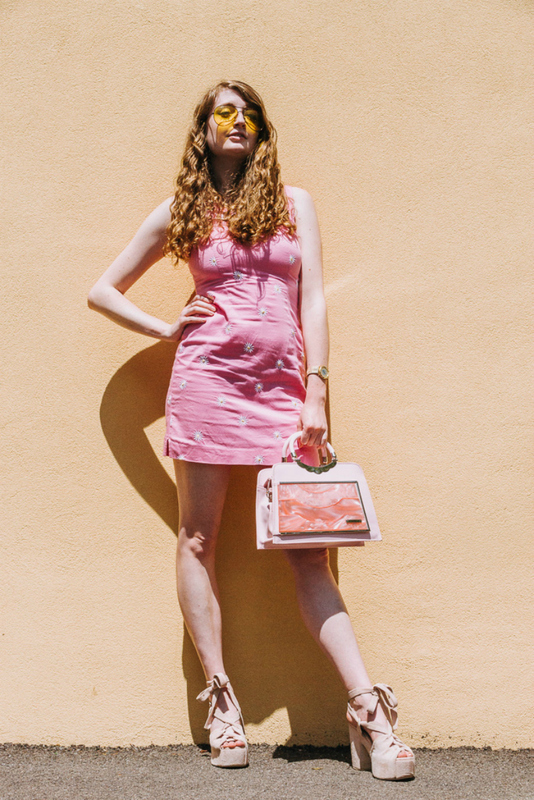 Select a pink dress with a nineties-inspired silhouette like this bodycon slip dress. 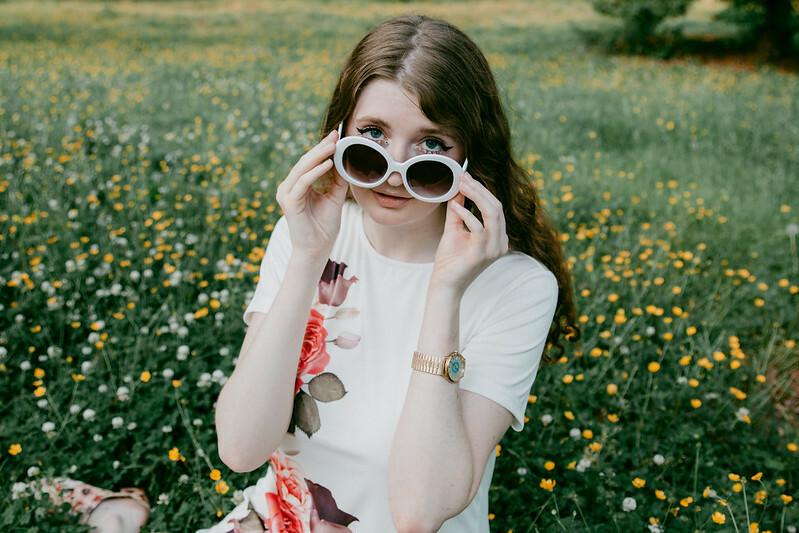 Style it with accessories with major nineties attitude such as a platform pair of heels, statement choker necklace, circle shades and cutesy daisy purse. 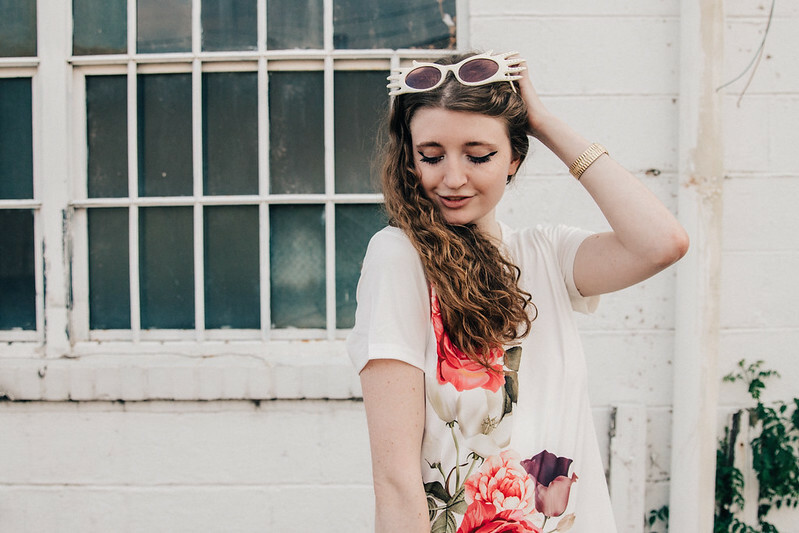 This look is perfect for lunch with your love or a night out on the town with your girls. 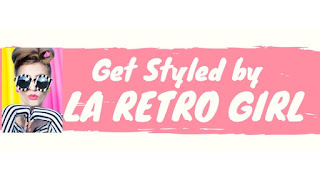 Option #3: High-fashion monochromatic pink icon. Select a pink dress with an interesting, trendy silhouette like this one. 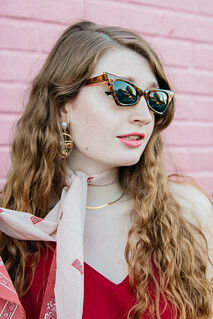 Style it with pink accessories with major fashion flair such as holographic pink heels and a unique pair of pink sunglasses. Wear this look for an art gallery opening party or date night. Hello! Would you believe that it has already reached ninety degrees in Richmond? 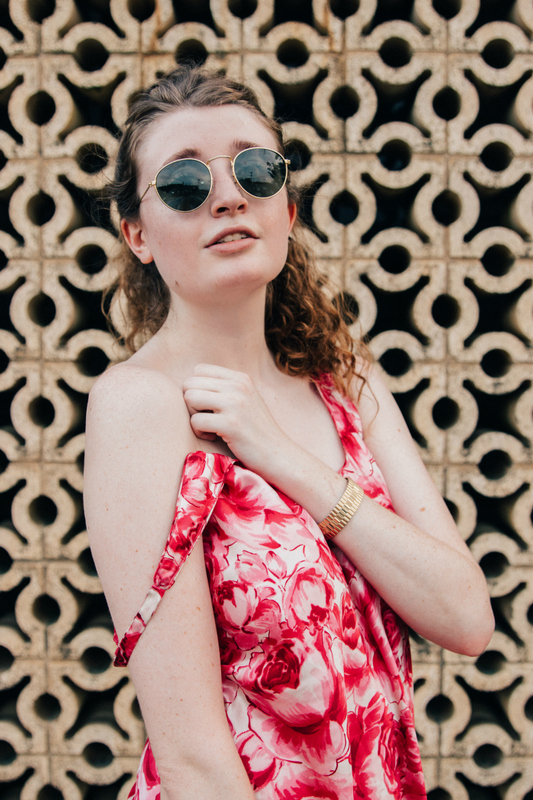 I think we're in for a long hot summer but hey, a long hot summer also means a summer full of the prettiest little slip dresses like this pink rose one. I thrifted this vintage slip dress from The Cosmic Circle at Rumors a couple months ago and find myself wearing it almost every week. When I initially purchased it, chilly weather still presided so I found myself first styling it over turtlenecks and with faux fur jackets. And now that it's warm out, I'm looking forward to all of the other various ways that I can wear it and style it. 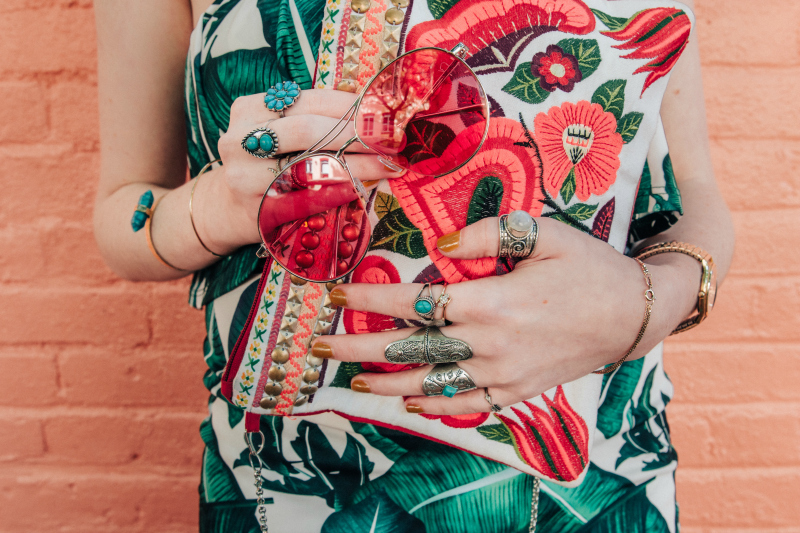 Ninety degree weather really prohibited much layering with this look so I decided to kill it with an army of fierce accessories instead. 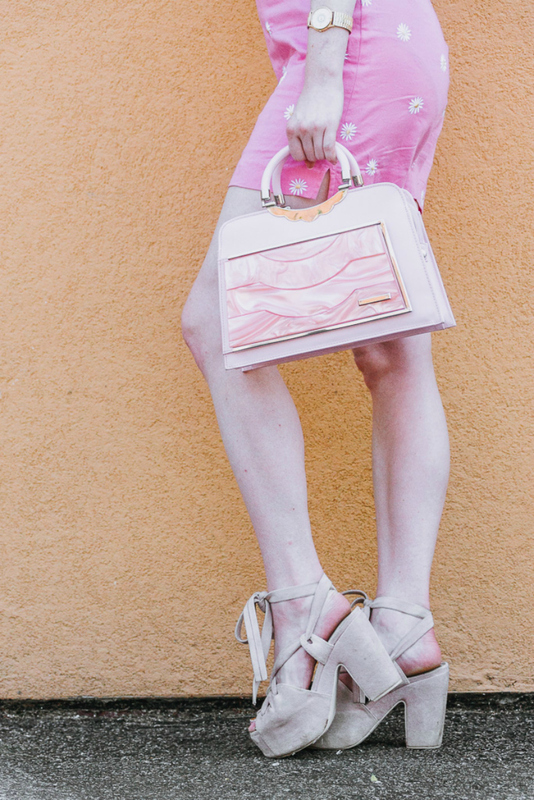 I played up the feminine colors and rosy print of the dress by slipping on a complementary pair of light pink floral mules. 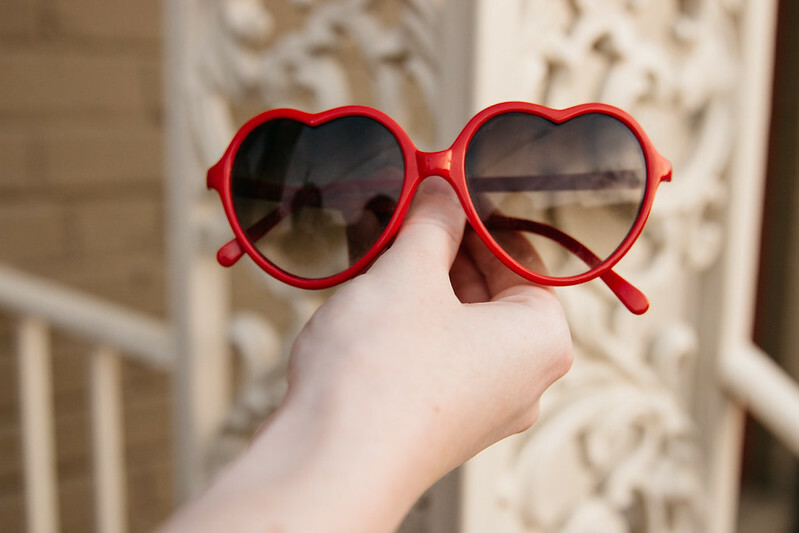 I switched on and off between two pairs of killer shades for this photoshoot- a quirky pair of red heart sunglasses and classic golden shades. A vintage golden watch, a vintage golden purse and rhinestone adorned lash lines perfected the look. Photos by Rachel Dwyer Photography. Browse more of her work on her website or her Instagram. Hello! I recently discovered this gorgeous checked dress at a local thrift shop on one of my buying excursions for RaddayVintage. Its vibrant blue color and retro gingham print immediately caught my eye. Upon closer inspection, I came to realize that this wasn't just some pretty dress hanging in a thrift store but a true sixties gem. 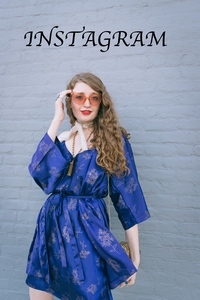 I might have ventured off to the thrift store to purchase inventory for RaddayVintage but as soon as I examined this dress, I knew that I wanted it hanging in my personal wardrobe instead. One of the other things I love about this dress besides its obvious beauty is its character. You can see seams and areas of the dress that have suffered a fair amount of wear and tear followed by meticulous repairs. And that's incredible to me. There's a story behind this dress. Someone loved this dress to death; they wore it again and again and simply kept repairing it again and again. And that takes love. It's a mystery to me how such a well-loved dress could end up at a thrift store but I'm thrilled to have been able to add a dress with such character to my wardrobe. 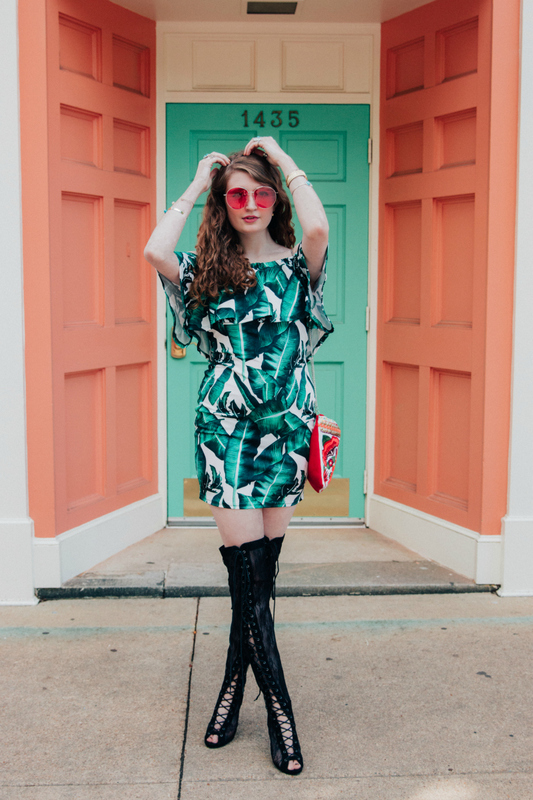 For this look, I played up the retro appeal of the dress by styling it with a pair of disco-inspired metallic heels, a vintage golden purse and seventies chic yellow aviator sunglasses. 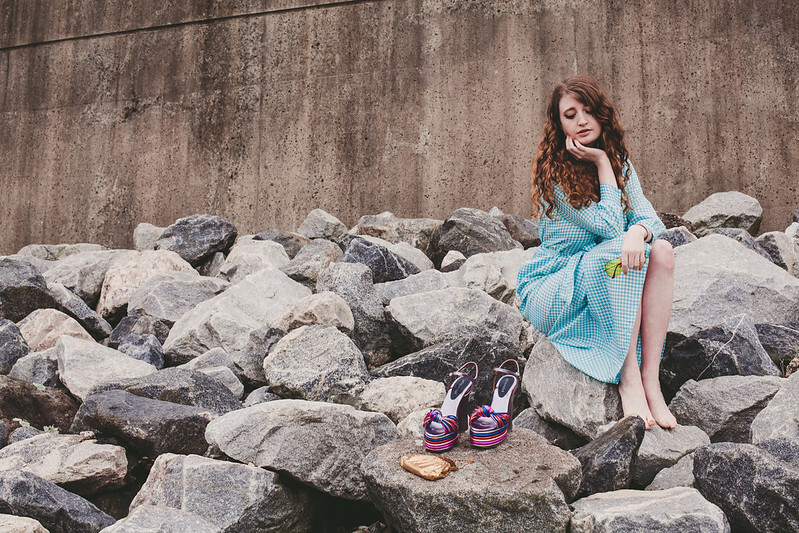 Shooting on the rocks down by the James River enhanced the nostalgic mood of the look even more. Photos shot by Ashley Loth of Sound Snap Photography. You can browse more of her work on her website.